!c---Display a window containing the graph. The program works as desired. Within the mdi-frame two attached windows (upper and lower) show the drawing. But by this course new windows are opened at each call of the subroutine BI_EI_GI. Therefore, at the end of the iteration a lot of windows lay on the screen one upon the other accurately, sometimes 2x20 and more. A control (iw0=winio@('%lw',ctrl_eiz) or a handle (iw0=winio@('%hw',hndl_eiz) of the current window create both a child-window, which stops the flow. The aim is, that after the first call of BI_EI_GI the window is updated and not created newly. What have I to do? The arrays of data supplied to %PL should continue to be available for as long as the window is displayed. In particular, the data will be re-plotted if the window is re-sized. It is also possible to call the routine SIMPLEPLOT_REDRAW@ to force all such plots to be re-drawn using whatever values are currently present in the arrays. Perhaps you should create the %pl window once (outside BI_EI_GI) and use only SIMPLEPLOT_REDRAW@ within the subroutine? Paul's comments on 29th June & 30th June which implies that is in the v8.3beta279 dlls. in the section starting: "The drawing of a graph can be delayed in one of three alternative ways: ..."
And the EXAMPLE 2 there is worth studying as it brings several of these things into play. PS1 - in that link just given I noticed the qualifier (?) listed, but with no description - what does it do ? PS2 - in the first documentation linked to earlier above it's probably wise to include an asterisk against all occurences of 'SIMPLEPLOT_REDRAW' to say that for log plots 'PLOT_REDRAW' should be used. The last days I've tested some possibilities to find a solution, but with no great success. This error is incomprehensibly, because the new data (xdata,ydata) is produced in the calling routine FLAPLO and transferred with the list to BI_EI_GI. It's strange, that the error is done at the call of the upper window (NOU=1), but on the screen the lower window is cleared simultaneously. ??? A test with "plot_redraw()" instead of "simpleplot_redraw()" produces a linker error: "file not found". A new library is needed (Beta279), but this could be precariously for the other parts my program. Only the title and the red and blue curves are varied and should be updated step by step. But in one step both windows are changed, at first the upper, then the lower. The red curve shows the course of the calculation done with material specifications as a polygon, the blue the approximation as a polynom. I am by no means an expert in %pl, but I am unsure of your selection (and definition) of the 2 windows you are using and the separate definition of arrays for each window. If you are updating windows, are the variables ist, xdata and ydata different and unique to the 2 windows ? I would expect that to have 2 widows that you are updating, then the %pl argument addresses must be separate/unique for the 2 windows and these addresses must be maintained for each window. Could window_update@ (xdata) or update_window@(hndl_eiz) work better. I assume hndl_eiz are supplied integer*4 handles and not returned integer(7) handles ? Is the following change necessary (or where are the graphics objects defined) ? I'mnot sure how the %pl handles are created, which is why Iasked the question of Paul in my comment above of where the documentation of the grave qualifier for %pl is located. Note also I've corrected one of the links in my previous comment. Read the section starting 'The following functions can be called after a window has been formed in order to change the data. ' 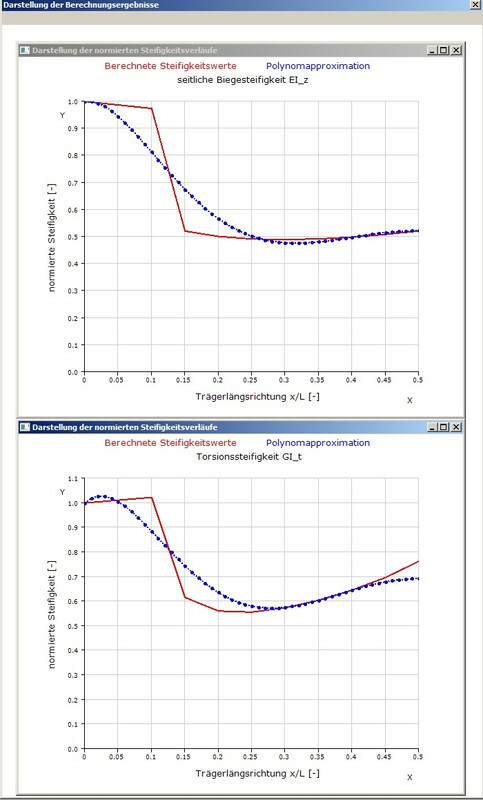 to see the use of the CHANGE_PLOT_DBL@ function and xample 2 for an application. Just a thought but I've just noticed that your handles variables are local to the subroutine. I'd have thought best to wsett up the windows first time round in a seperate routine. And pass all these variables globally vi a module , or at least via the subroutine parameter list? From your replies I recognize, that still some more explanations are necessary about the process of drawing. At each call of "FLAPLO" these two plots has to be done. At the first call, K3 has the value 1 and in that case only the code, which JohnCampbell has mentioned, is executed with all needed settings. In this process with the code "iw1=winio@('%`pl', ... ,hndl_eiz)", respectively iw2=winio@('%`pl', ... ,hndl_git) an access point to the particular plot the should be created, remembering that the hndl-values are [input] for %`pl. Anyway I hope this. At the second call, K3 has the value 2,3,... and in that cases the updates are be done, always for the upper and the lower window. Therefore at the start of BI_EI_GI the IF-statements "IF (K3 .GT. 1 ... ) shall manage that. Insofar my wish, but until now unsuccessful! I don't understand this error, because the xData is available. It's transferred over the list from FLAPLO to BE_EI_GI. The relevant data is printed on the control-window. I'm perplexed and don't know where to find the correct hints. A paradigm may be helpfully. At least "gobbledygook" is a funny expression. In german that is to say "Kauderwelsch", what means that someone is speaking chinese and nobody is able to understand the words. Define a set of variables for both plots, like XPLOT_1 and YPLOT_1 for the first graphics, XPLOT_2 and YPLOT_2 for the second. Initialise them at the beginning to zero. Make the data transfer via a common block like COMMON /PL_DATA/ XPLOT_1,YPLOT_1,XPLOT_2,YPLOT_2 (instead of transferring them via the variables list of the subroutines). In this way, you don't need handles nor select_graphics-object@() or similar, and also you make sure that all relevant data are present when calling simpleplot_redraw@(). Please note that the code is written in the f95 free-format style and tested with FTN95, version 7.10.0 (32 bits). - The creation of the plot-data is an expensive iteration process with a lot of subroutines, which couldn't be installed simply into a function like shown in the example. - The predominant parts of the program source code is written in F77. All significant arrays, under it the plot arrays xplot(..,..) yplot(..,..), are dynamically dimensioned in the main program and transferred over the calling lists into the subroutines. - These two plot arrays are used during the flow of the program from three subroutines with in their dimensions very different plot data to show the calculated results. To put these plot arrays into fixed dimensioned common-blocks would be meant, that than an own fixed common-block has to be created for each plot, instead of one array for all plots as now. - A problem at your proposal is, that your program opens one window with two plots, which are updated. But my program opens two windows each with one plot, which should be updated one after another. In doing so I suppose problems with the allocation. Seeing that the program works without an "updating-windows" process, the operating expence to realise these update process like your proposal is too great. Then the results will shown in multiple windows still and not in one window only. The program user don't notice that, because the windows lie on top of each other exactly. Maybe a way will be found to realise an update process, which matches to my actual procedure. Two windows with each one plot is no problem. For variable dimensions of the arrays you may use a module. Below is my next example, first the module, then the main program, the rest given as subroutines. Now written in the traditional f77 fixed format. Perhaps this can help a little bit. If you like you may contact me via wilfried.linder@uni-duesseldorf.de - this might be easier for larger code examples. Both windows in the example before are created once. The calculation subroutine abc only updates the graphics but creates no new windows. In my examples, I use one-dimensional arrays (xplot_1,yplot_11,yplot_12,...). Now I tried to use two-dimensional arrays like you, and then got the error message "Invalid data value supplied to %PL" - exactly what you wrote on Monday 17.09., post from 3:54, marked in red. So, it seems that %pl can only handle one-dimensional arrays. ... BUT ... The COMMON block doesn't appear in the subroutine ! In BI_EI_GI (and FLAPLO) the full arrays are passed in the parameter list, but only declared within the range (NWDIM,KU) . Is this a potential problem ? What version number of ftn95 are you using exactly ? P.S. almost forgot, the phrase you gave as an equivalent of gobbledygook - as it's relaed to language the english equivalent would be closer to 'Double Dutch' i.e. twice as difficult as Dutch is for english people, or 2x impossible to understand ! as in " I heard what he said but it was all double dutch to me" Gobbledygook can relate to many things, not just language as in: "C or C++ is complete gobbledygook to most Fortran users"